Background: Oral disorders can have a negative impact on the functional, social and psychological well-being of children and their families. Oral health and dental treatment may have an impact on eating, speaking and appearance, thereby affecting quality of life. Thus, there has been a greater focus on the measurement of quality of life as a complement to the clinical measures. Objective: The aim was to assess the prevalence, characteristics and severity of oral impacts in south Indian school children using Child-Oral Impacts on Daily Performances (Child-OIDP) index as a measure of oral health related quality of life. Methodology: A cross-sectional study was undertaken among the six government, and six private school children aged 11-12 years, of Karnataka, South India randomly selected as cluster, and all their 563 children were invited to participate. A cross culturally adapted and validated oral health-related quality of life measure; Child-OIDP was used to assess oral impacts. Results: The common perceived oral health problems were tooth ache reported by 342 children, a sensitive tooth reported by 230 children, tooth decay - hole in the tooth reported by 226 children. Eating was the most common performance affected (68.3%). The severity of impacts was high for eating and cleaning mouth and low for the study and social contact performances. Conclusion: The study reveals that oral health impacts on quality of life of school children of Karnataka aged 11-12 years. Oral impacts were prevalent, but not severe. The impacts mainly related to difficulty eating. Toothache, a sensitive tooth, tooth decay and bleeding gums contributed largely to the incidence of oral impacts. Introduction: The professional profile of the public health dentist is made up of a number of competencies. Evaluation of the student's performance in relation to the specified competencies is an important task for purposes of student evaluation and for assessing the curriculum and making necessary revisions. Aim: The aim was to assess the level of self-perceived competency in dental public health among postgraduate (PG) students in India. 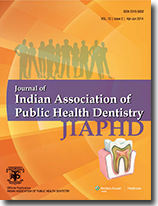 Materials and Methods: A cross-sectional study was done among the PG students in the specialty of public health dentistry in India. Their competency was assessed by a questionnaire sent through E-mail. Students assessed their competence in these dental public health functions using a 3 point ordinal scale, 0 indicating "not at all competent," 1 as "competent," and 2 as "very competent." Chi-square has been used for categorical variables. Results: One-hundred and twenty-four PG students responded to the questionnaire. Comparison was made for gender and academic year. Males were significantly competent to comply infection control policies and procedures (P < 0.040*). Third year PG students were significantly competent to comply infection control policies and procedures (P < 0.017) and to adapt their dental practice to the existing laws and regulations (P < 0.45). 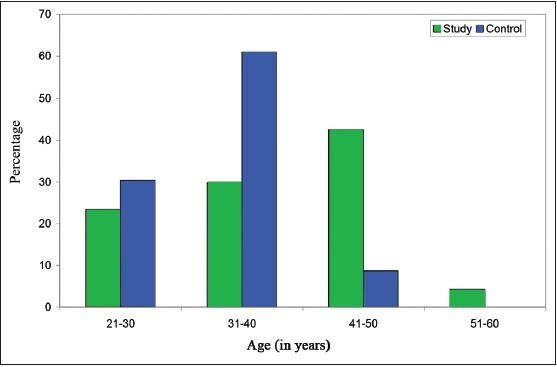 Conclusion: In the present study, the PG students considered themselves more competent to elaborate the socioeconomic-cultural diagnosis of the community, to participate in epidemiological surveillance system and less competent to adopt ethical principles in all aspects of community oral health activities, to take up initiatives in advocacy issues for health policy and using media effectively. Objective: To assess the knowledge of dietitians regarding diet and oral health in Bengaluru city. 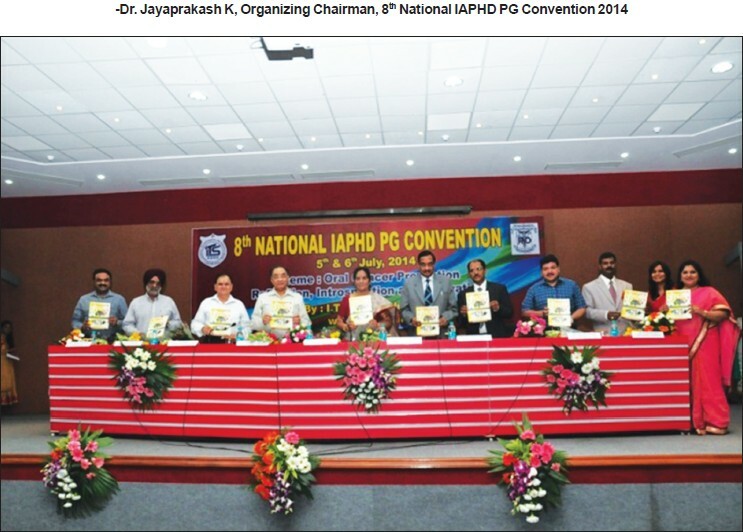 Materials and Methods: A cross-sectional study was conducted among the life members of Indian Dietetic Association, Bangalore chapter. A close ended, self-administered 23 item questionnaire was distributed and collected after 10 min. The data was subjected to statistical analysis. 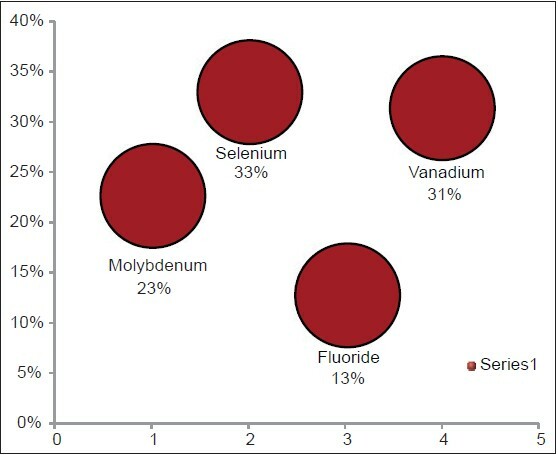 Results: About 36% felt dietary supplements can prevent oral mucosal diseases, and only 12% were aware that high content of fluoride in water leads to abnormal tooth defects. Overall knowledge of dietitians pertaining diet and oral health was 56.48%. Conclusion: Study highlights the deficiency of knowledge of dietitians regarding oral health. The multifaceted interactions between diet and oral health in practice, education and research in both dietetics and dentistry merit detailed delineation. 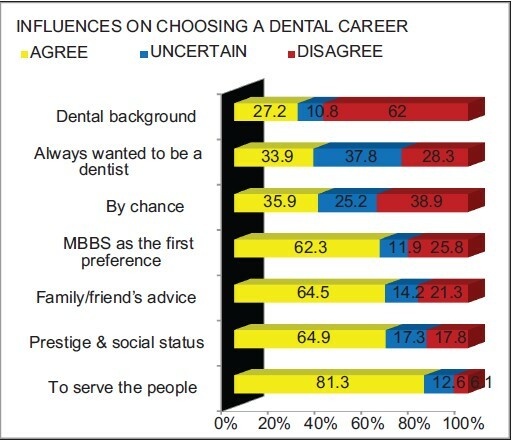 Introduction: The purpose of this cross-sectional study was to assess and compare self-perceived and normative dental needs among teaching faculty of Visveswarapura Group of Institutions, Bangalore, India. Materials and Methods: The study population included 217 teaching faculty from four Visveswarapura Group of Institutions namely Arts and Commerce, Law, Science College and Engineering College. The study population was subjected to a self-administered closed-ended questionnaire inquiring about their socioeconomic status, Oral health status and treatment needs. Clinical examinations, employing WHO dentition status and community periodontal index were performed to determine normative status and needs. Perceived and normative assessments were compared for sensitivity, specificity, positive and negative predictive values using Kappa statistics. Results: The degree of agreement (κ values) and sensitivity was seen in filled teeth (0.839, 80%), missing teeth (0.696, 85.2%), and mobile teeth (0.57, 55.6%). However, the disagreement was seen with all other questions with average κ = 0.20. Regarding overall proportions, a large discrepancy was found between self-perceived and normative needs for both dental and periodontal health status. Conclusion: Self-assessment questionnaires were of low value in evaluating oral health status and treatment needs compared with clinical examination.